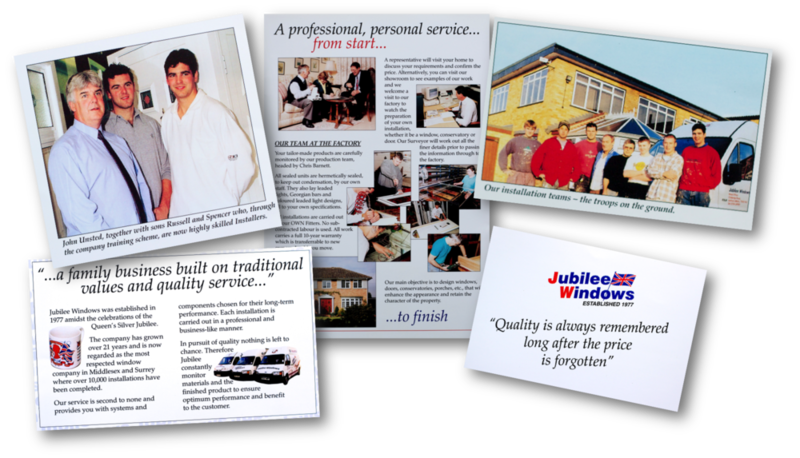 Jubilee Aluminium Home Improvements was established back in 1977 by John Unsted. Originally working from a garage, John grew the company and moved to a factory space of over 12,000 square feet. Windows, doors and conservatories were all manufactured to the highest standards. As it is now, the installations were all completed by Jubilee's own fitters, no subcontracted labour has ever been used. Over 30 years later John's two sons Russell and Spencer are Partners in the company and have been fitting windows together for over 25 years. The company has always thrived on it's excellent team work. The Jubilee team all work together on a daily basis to achieve an excellent level of customer service. Our sales representatives have been with the company for over 25 years, providing a high level of expertise. As a result, Jubilee Installations is a friendly company with a history of high standards and a personal service. Our main objective is to install windows, doors, conservatories and other products that will enhance the appearance and retain the character of the property. Achieving customer satisfaction is our number one goal. Over 90% of our work comes from recommendations.